Click the picture to enlarge or read the text further down! Tobias Dahlin has been a diver since he was fifteen and today he is one of the most renowned underwater photographers in Sweden. He has won the Swedish Championships in Underwater Photography two times, 2008 and 2011. He also won medals of all denominations in the Nordic Championships. Tobias is the author of Bättre bilder / Dyk! – an illustrated guide to underwater photography. In 2012 he was awarded the Hasselblad Foundation nature photography stipend for his project The Kattegatt and the Skagerakk – on beauty and environmental problems. 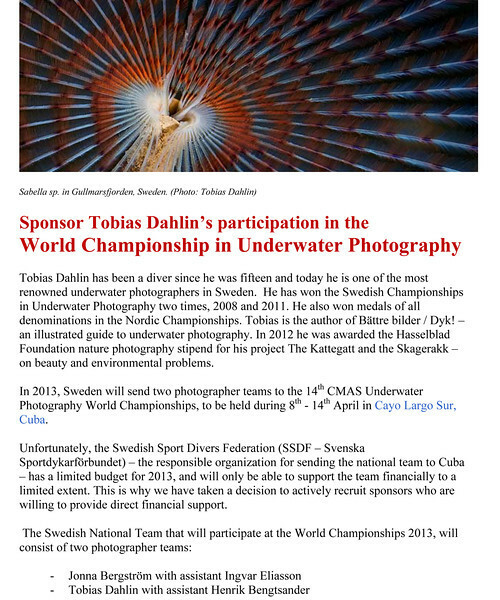 In 2013, Sweden will send two photographer teams to the 14th CMAS Underwater Photography World Championships, to be held during 8th - 14th April in Cayo Largo Sur, Cuba. Unfortunately, the Swedish Sport Divers Federation (SSDF – Svenska Sportdykarförbundet) – the responsible organization for sending the national team to Cuba – has a limited budget for 2013, and will only be able to support the team financially to a limited extent. This is why we have taken a decision to actively recruit sponsors who are willing to provide direct financial support. The contestants have agreed that each photographer should do individual fundraising for his/her buddy team. 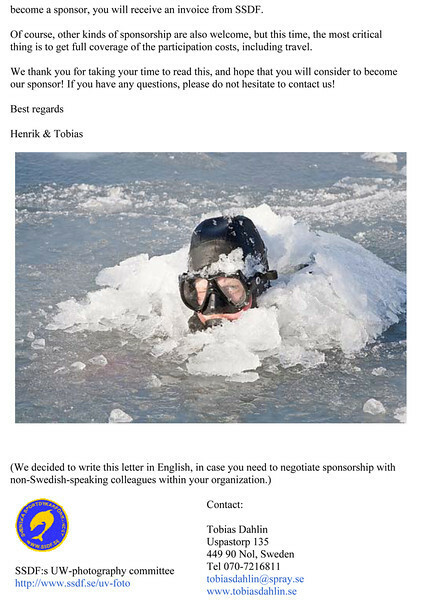 Thus, this call for sponsors concerns Tobias Dahlin and Henrik Bengtsander. We can offer you an easy and mutually beneficial way to sponsor us! 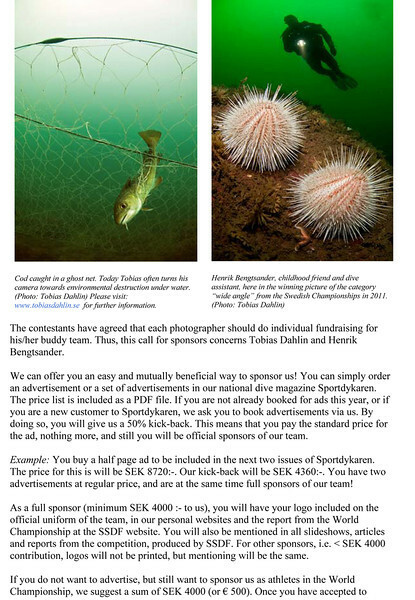 You can simply order an advertisement or a set of advertisements in our national dive magazine Sportdykaren. Please, contact us for the price list. If you are not already booked for ads this year, or if you are a new customer to Sportdykaren, we ask you to book advertisements via us. By doing so, you will give us a 50% kick-back. This means that you pay the standard price for the ad, nothing more, and still you will be official sponsors of our team. Example: You buy a half page ad to be included in the next two issues of Sportdykaren. The price for this is will be SEK 8720:-. Our kick-back will be SEK 4360:-. You have two advertisements at regular price, and are at the same time full sponsors of our team! As a full sponsor (minimum SEK 4000 :- to us), you will have your logo included on the official uniform of the team, in our personal websites and the report from the World Championship at the SSDF website. You will also be mentioned in all slideshows, articles and reports from the competition, produced by SSDF. For other sponsors, i.e. < SEK 4000 contribution, logos will not be printed, but mentioning will be the same. If you do not want to advertise, but still want to sponsor us as athletes in the World Championship, we suggest a sum of SEK 4000 (or € 500). Once you have accepted to become a sponsor, you will receive an invoice from SSDF. Of course, other kinds of sponsorship are also welcome, but this time, the most critical thing is to get full coverage of the participation costs, including travel. We thank you for taking your time to read this, and hope that you will consider to become our sponsor! If you have any questions, please do not hesitate to contact us!